Skin cream and serum that help optimize skin's own natural collagen level and maintain skin's youthful appearance, plus an eye cream formulated with key complexes that have been shown to target and improve the look of fine lines, wrinkles and temporarily uplift the look of skin around the eye area. 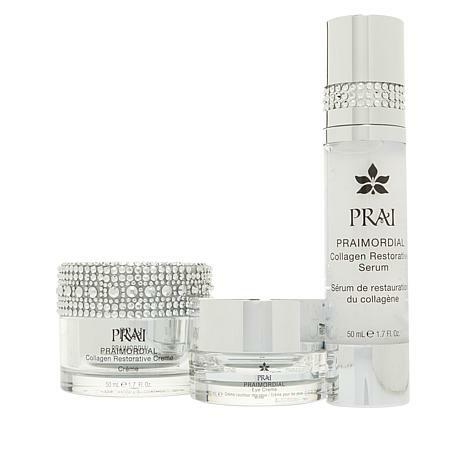 Apply Praimordial Collagen Restorative Serum over clean face morning and/or evening. 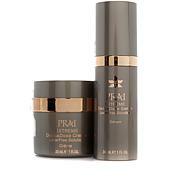 Use alone or followed by Praimordial Collagen Restorative Creme. 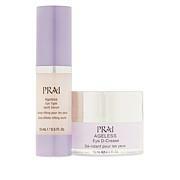 Twice daily, dab a small amount of Praimordial Eye Creme under and around the eye area. Pat gently to blend. Ingredients: Aqua/Water/Eau, Glycerin, Ethylhexyl Isononanoate, Isononyl Isononanoate, Cyclopentasiloxane, Pentylene Glycol, Ammonium Acryloyldimethyltaurate/VP Copolymer, Isodecyl Isononanoate, Squalane, Potassium Cetyl Phosphate, Sodium PCA, Fullerenes (Nano) Arginine, Glycine, Alanine, Serine, Valine, Threonine, Proline, Isoleucine, Acetyl Tetrapeptide-22, Hematite Extract, C4-24 Alkyl Dimethicone/Divinyldimethicone Crosspolymer, Polyethylene Glycol Adipate, Di-Bis-PEG-2 Soyamine/IPDI Copolymer, Zingiber Cassumunar Root Oil, Polysorbate 20, Dimethicone, Sodium Lactate, Caprylyl Glycol, Aspartic Acid, PCA, Phenylalanine, Histidine, Disodium EDTA, Phenoxyethanol, o-Cymen-5-OL, Amyl Cinnamal, Benzyl Salicylate, Citronellol, Hexyl Cinnamal, Butylphenyl Methylpropional, Limonene, Alpha-Isomethyl Ionone, Fragrance (Parfum), Red 4 (CI 14700), Yellow 5 (CI 19140). Ingredients: Propylene Glycol, Aqua/Water/Eau, Cyclopentasiloxane, Alcohol Denat., Cyclohexasiloxane, Glycerin, PEG/PPG-18/18 Dimethicone, Octyldodecyl Stearate, Palmitoyl Tripeptide-5, Hematite Extract, Galacturonic Acid, Sodium Hyaluronate, Calcium Aluminum Borosilicate, Dimethiconol, Tetrahexyldecyl Ascorbate, Isodecyl Isononanoate, C4-24 Alkyl Dimethicone/Divinyldimethicone Crosspolymer, Polydiethyleneglycol Adipate/IPDI Copolymer, Zingiber Cassumunar Root Oil, Silica, Tin Oxide, Sodium Chloride, Phenoxyethanol, Fragrance (Parfum), Amyl Cinnamal, Benzyl Salicylate, Hexyl Cinnamal, Butylphyenyl Methylpropional, Limonene, Alpha-Isomethyl Ionone, Titanium Dioxide (CI 77891). Isohexadecane, Butylene Glycol, Isodecyl Isononanoate, Cetyl Alcohol, Butyrospermum Parkii (Shea) Butter, Glyceryl Stearate, Silica, Sodium Polyacrylate, Acetyl Dipeptide-1 Cetyl Ester, Hematite Extract, PEG-75 Stearate, C4-24 Alkyl Dimethicone/Divinyldimethicone Crosspolymer, Polydiethyleneglycol Adipate/IPDI Copolymer, Ceteth-20, Steareth-20, Zingiber Cassumunar Root Oil, Xanthan Gum, Sorbitan Laurate, Hydroxyethylcellulose, Disodium EDTA, Ethylhexylglycerin, Phenoxyethanol, Titanium Dioxide (CI 77891). Confident in the country ! I am hoping this cream works because the neck cream is a cult favorite. But I LOVE the packaging. IT is so pretty! I need to order another doggie container for my neck cream. I love, love, love the sparkle! I love Prai! I've been a Prai customer for years and I haven't been disappointed yet. Their products don't feel heavy or greasy. I've been using the 24K Gold line but thought I would give this a try and it's also great. I feel like my face glows with these products. Just began using these products & could feel the firming & smoothing. Prai is the best! Not a full review b/c I haven't used long enough. So far so good. Feels great & almost no scent-- which is good! Very impressed w/the product quality & packaging. Each product has it's own seal or vacuum seal-- inside a sealed bag. Hate it when there's no inside seal. Just being inside a box-- doesn't mean it's not been opened. Def. costs more to do this but I really appreciate that Prai has the added quality protection. Thank you Cathy Kangas & Prai team. Awesome!! !